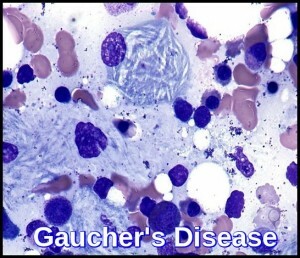 Gaucher’s Disease is an autosomal recessive condition most common in Jews. There is β-glucocerebrosidase deficiency causing deposition of glucocerebroside and related compounds, leading to hepatosplenomegaly, CNS changes and bony infiltration. Glucocerebrosidase normally hydrolyzes glucocerebroside to glucose and ceramide. Genetic defects of the enzyme cause glucocerebroside accumulation in tissue macrophages through phagocytosis, forming Gaucher cells (with onion skin appearance). Accumulation of Gaucher cells in the perivascular spaces in the brain causes gliosis in the neuronopathic forms. The course of the disease is very variable. Type I (non-neuronopathic) is most common (90% of all patients). Residual enzyme activity is highest. Ashkenazi Jews are at greatest risk. Patients with type 1 disease commonly present with painless splenomegaly, anemia, or thrombocytopenia. Type II (acute neuronopathic) is rarest, and residual enzyme activity in this type is lowest. Onset occurs during infancy. Symptoms and signs are progressive neurologic deterioration (eg, rigidity, seizures) and death by age 2 yr. Type III (subacute neuronopathic) falls between types I and II in incidence, enzyme activity, and clinical severity. The blood film often shows features of hypersplenism and typical Gaucher cells are found in the bone marrow. Diagnosis can be confirmed through measurement of glucocerebrosidase activity in WBCs. A finding of less than 15% of mean normal activity is diagnostic; carriers are detected, and types are distinguished by mutation analysis. Treatment for types I and III include enzyme replacement with glucocerebrosidase, and sometimes miglustat, eliglustat, splenectomy, or stem cell or bone marrow transplantation; there is no treatment for type II. N.B. specific enzyme replacement therapy is very expensive!